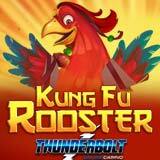 Realtime Gaming's new Kung Fu Rooster real money online slot game is coming to South Africa's Thunderbolt Casino next week. Introductory bonuses are now available and more bonuses that include free spins will be available when the new game arrives July 19th. Kung Fu Rooster’s Wild and Scatter symbols can significantly increase wins. The cocky Rooster Wild symbol is more than just a martial arts champion – he also doubles any win that he’s part of. Three or more Monkey scatter symbols triggers 25 free spins. During free spins, the Fire Claw Multiplier increases the win multiplier with each winning spin to a maximum of 25X the bet. Players can bet from $.08 to $1 per line per spin on this 5-reel, 12-payline bonus video slot. The top win is 50,000X the bet. Like all of its newest games, this new feature-packed Asian-themed slot is available in high resolution widescreen format in Thunderbolt’s download and instant play casino for desktop and laptop casinos and is also offered in the mobile casino for smartphones and tablets. Introductory casino bonuses up to R2000 available until July 31, 2017. May be claimed up to three times. Valid until July 31, 2017 only. Valid July 19 - 31, 2017 only. South African online casino players can enjoy hundreds of games from RTG, all played in South African Rands, and get customer service in either English and Afrikaans.